A series of proposals at the federal level have focused on Medicaid, the healthcare coverage program for low-income people that goes by the name “Medi-Cal” in California. There has been an intense focus, in particular, on the budgetary cost of coverage through this program. Therefore, whether one believes enrollment in the program needs to be expanded or curtailed, it is essential to increase the affordability of the care that the program finances. 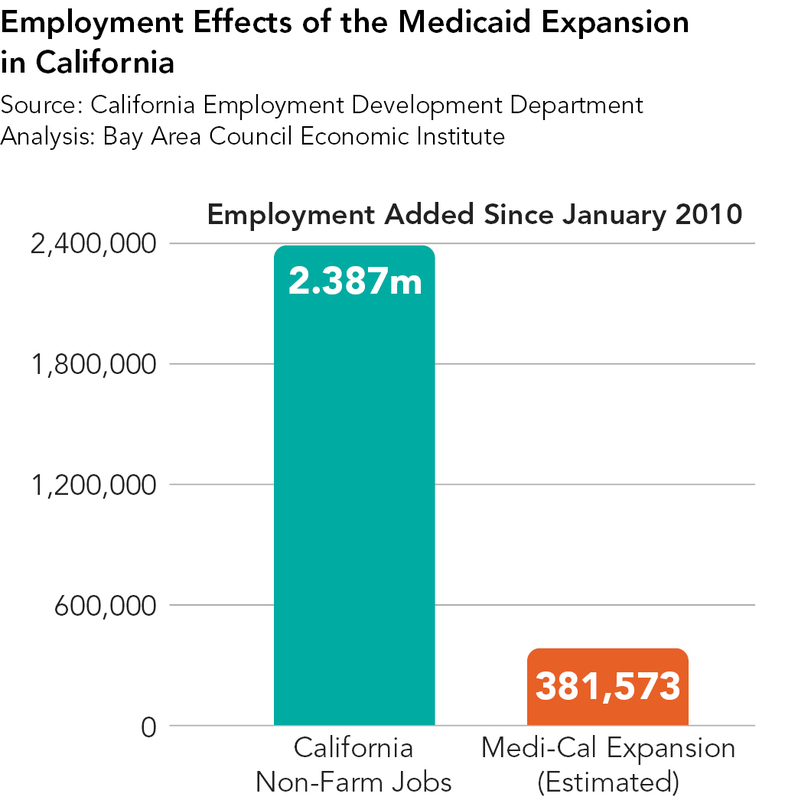 This brief lays out some key statistics and considerations—particularly related to the impact of Medi-Cal on the state economy—that policymakers should take into account. It also advances a series of policy recommendations aimed at increasing both the quality of the care Medicaid finances, as well as the fiscal sustainability of the program. Micah Weinberg is currently President of the Economic Institute at the Bay Area Council. In this role, he manages a team of professional researchers who produce world class economic and policy analysis and insight. Economic opportunity, affordable housing, reliable transportation, and lifelong learning are the pillars of personal and community health. Dr. Weinberg’s own research and advocacy focuses on improving these “social determinants” of health as well as on expanding access to high quality, afford-able healthcare. Before coming to the Council, Micah was Senior Research Fellow at the New America Foundation. Dr. Weinberg’s writing has appeared in diverse outlets from Politico to Policy Studies Journal, and he has appeared on Fox News and NPR. He holds a doctoral degree in Political Science from the University of North Carolina at Chapel Hill and graduated with honors from Princeton University with a degree in Politics. Lanhee J. Chen is the David and Diane Steffy Research Fellow at the Hoover Institution and Director of Domestic Policy Studies and Lecturer in the Public Policy Program at Stanford University. He is also Counsel at the law firm of Arent Fox LLP. Dr. Chen has served as an adviser to numerous public officials and was the policy director of the Romney-Ryan 2012 presidential campaign. He also served as a senior official at the U.S. Department of Health and Human Services during the George W. Bush Administration. Dr. Chen currently serves as a presidentially-appointed member of the Social Security Advisory Board—an independent, bipartisan panel that advises the president, Congress, and the Commissioner of Social Security on matters related to the Social Security program. He earned his PhD in Political Science from Harvard University and a JD from Harvard Law School. Enrollment in Medicaid is massive. Over 66 million people are covered by the program nationwide, more than 13 million of whom live in California.1 Over half of the kids in California have Medi-Cal coverage.2 It is also a major source of healthcare financing for working adults. 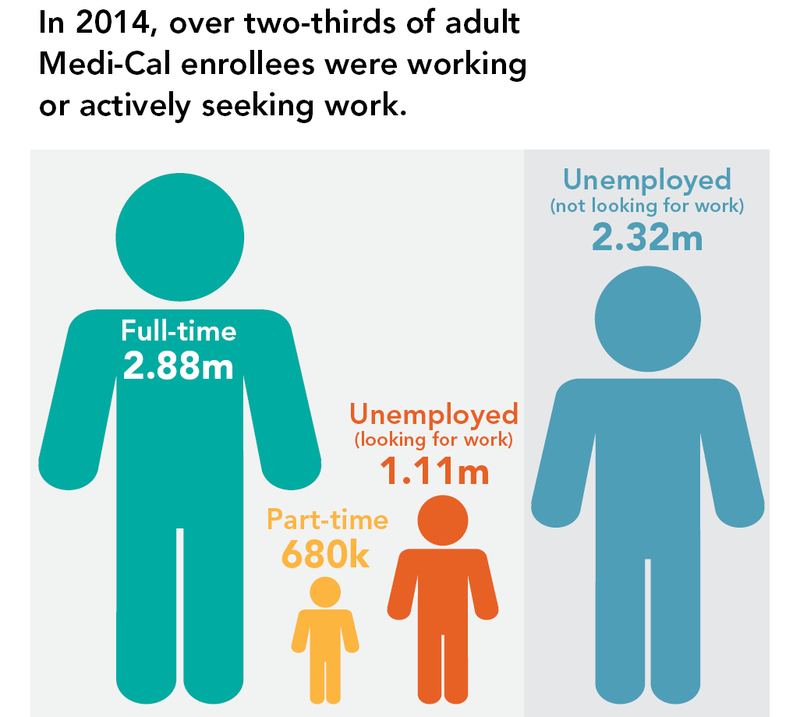 Over two thirds of the adults enrolled in Medi-Cal in California are employed or actively looking for work.3 In terms of expenditures—in California and at the federal level—85% of the program’s expenses support care for children, the elderly or the disabled. All of this healthcare coverage, however, comes at a significant and growing cost. 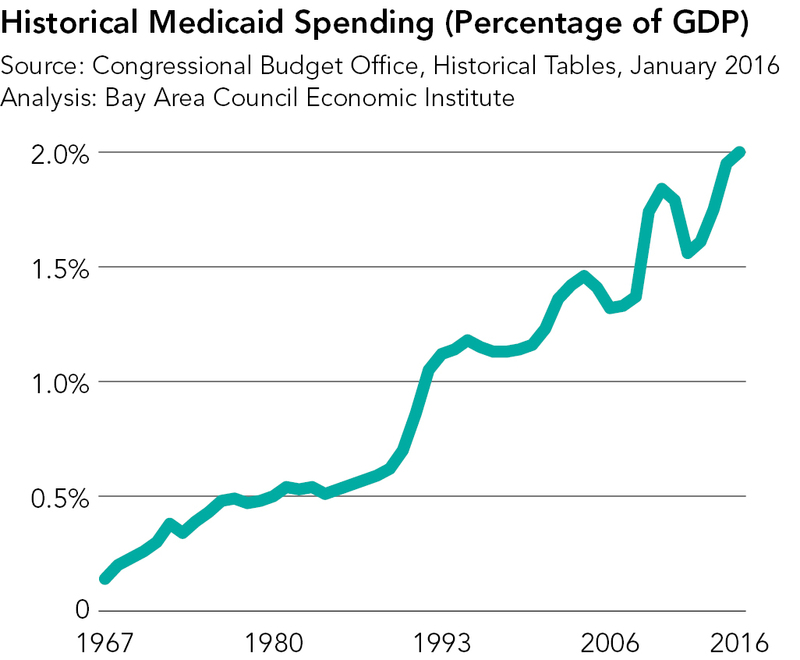 Federal and state spending on Medi-Cal has spiked, especially since the passage of the Affordable Care Act, due in large part to the ACA’s expansion of eligibility for the Medicaid program. 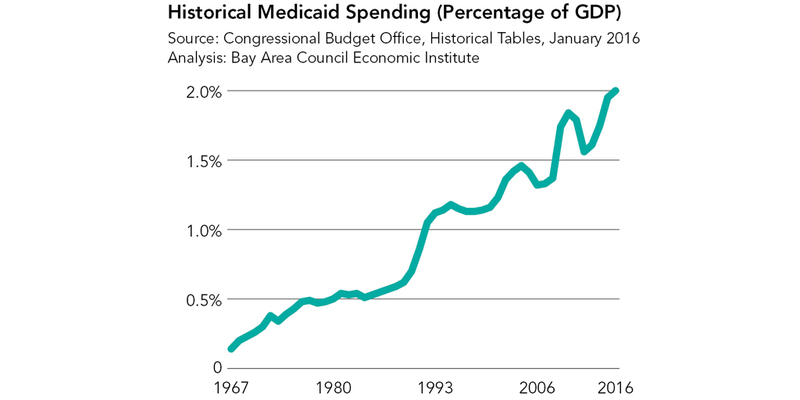 In 1974, Medicaid spending was only 0.4% of GDP. It is now above 2% and is expected to continue to rise further, contributing to the nation’s unsustainable budget deficits, which are almost entirely a factor of increasing costs for healthcare entitlements.4 Medicaid spending is not rising in isolation, of course, and is linked to broader upward trends in healthcare prices that are straining the budgets of businesses and families as well as of governments. In California alone, the total program costs, combining state and federal funds, are over $90 billion, dwarfing by orders of magnitude—and hence potentially ­crowding out—spending on other services such as higher education and public transportation that also benefit low-income residents. This high level of spending is in spite of the fact that the state has a below-average-cost program. 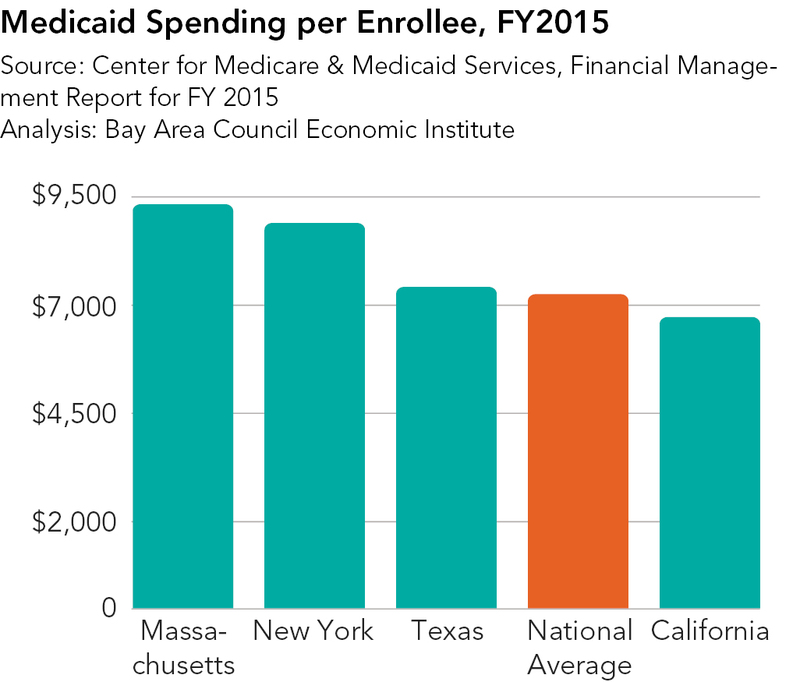 The yearly per capita cost of Medicaid in California is less than $7,000; Massachusetts per capita cost, by ­contrast, is over $9,000 per year. States should be given greater flexibility to structure their Medicaid programs to promote efficient delivery systems and incentivize high-value care. What often gets missed in these ideologically charged conversations is the importance of value for medical spending. This paper advances several promising areas to improve the affordability and quality of the ­healthcare services provided by the program. This should be a fertile area for cooperation among groups that might have very different perspectives on high-level health policy concerns. Medicaid is currently structured as an open-ended entitlement for its enrollees to the financing of ­healthcare services covered through the program. Past and future Congressional reform proposals aim to end this ­entitlement entirely and replace it with a fixed allocation of money for each state or a set amount of funding per enrollee, differing by acuity or characteristic (e.g., disabled beneficiaries would be funded at higher levels than healthy mothers and children). These reforms to the financing of Medicaid are generally accompanied by greater flexibility for states in the implementation of their programs. This is not just a technical tweak to the structure of financing; it is a completely different type of program based on a completely different vision of the role of the federal government vis-à-vis the states. For some this will be a feature, for others a bug, but it is important for people of all perspectives to understand the nature of the changes proposed. The variations in how the current entitlement ­funding works across different states and different types of people cov-ered by the program are almost infinite, and the administrative complexity of the program is virtually limitless. Federal waivers for state innovation make all state programs unique. The old adage is true: If you’ve seen one state Medicaid program, you’ve seen one state Medicaid program. In states like California there are tremendous differences from county to county as well. However, at a high level, for adults who were eligible for Medicaid before the passage of the Affordable Care Act, the federal government pays a percentage of health expenditures on a sliding scale. States with low per capita income, such as Arkansas, receive a 70% match and states with high per capita income, such as California, receive only about 50% of expenditures. The rate is different for children and for some other populations. 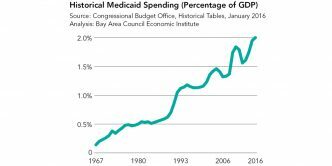 One problematic aspect of this system is that it may provide inadequate incentive for states to economize on Medicaid expenditures since it is often the case that more than half of the “savings” from any Medicaid cuts accrue to the federal government. As framed by James Capretta of the American Enterprise Institute, “Governors and state legislators are reluctant to impose $2.50 in budgetary pain for a $1.00 gain to their bottom line.”5 Another problematic aspect is that the matching rates are based on an inaccurate measure of the actual financial hardship of people in different states. Given its very high cost of living, the state of California actually has the highest rate of poverty in the nation, yet it has the nation’s lowest matching rate. The Affordable Care Act expanded eligibility for Medicaid, beginning in 2014, to all adults up to 138% of the federal poverty level. Another difference across states was created by a U.S. Supreme Court decision that made the Medicaid expansion optional. The costs of this expansion were initially borne 100% by the federal government and will shrink over time to 90%. Two-thirds of states chose to accept this expansion. This puts reformers in something of a bind as they attempt to address program financing, since over 15 million people6 in politically diverse states across the nation have newly come to depend on this program as have the budgets of the states that expanded Medicaid. The healthcare industries in these states also lobbied heavily for the expansion and have seen their costs for uncompensated care drop because of it.7 The contrast between the manner in which they were compensated for the care of the uninsured before and after reform is also complex but important to understand. Much of this care was financed through “Disproportionate Share” (DSH) payments to hospitals that were ratcheted down by the ACA as it expanded Medicaid and provided income-based subsidies for private insurance (though these cuts were repeatedly delayed). Matching rates are based on an inaccurate measure of the actual financial hardship of people in different states. Given its very high cost of living, the state of California actually has the highest rate of poverty in the nation, yet it has the nation’s lowest matching rate. In addition to carefully considering how the structure and financial support for the healthcare coverage of low-income residents affects the quality of care they receive, it is important to be aware of the potential economic impacts of health insurance coverage. For low-income Californians, the Medi-Cal program is an important source of that coverage. These economic impacts could take at least two forms. The first is the improvement in health and productivity of lower-income people that results from having access to healthcare. The second is the economic impact of the money that is spent within the healthcare system on their behalf. This second category of impacts is a double-edged sword. Money spent on the healthcare sector supports growth in healthcare jobs and has a multiplier effect throughout the broader economy. On the other hand, this spending—particularly if it grows in an unsustainable manner—crowds out spending on other goods and services. Within the context of the state budget, ­healthcare spending competes directly with spending on K–12 education, higher education, public transportation, and other key priorities. These are important for the broader public and especially for lower-income Californians who rely more heavily on the public education and public transportation systems. One of the most concrete pieces of evidence we have on the direct connection between insurance coverage and productivity is the fact that, according to a major survey, employees with health insurance on average missed 4.7 fewer days than those without coverage. It also found that investments in preventive care had a positive impact on the number of healthy employees. To develop an estimate of the increased productivity that accrues to the California economy as a result of Medi-Cal, a 2016 study by the Bay Area Council Economic Institute used ­coverage and employment data from the California Health Interview Survey and wage data from the Consumer Population Survey. 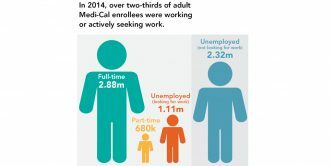 Assuming a gain of 4.7 working days per year as a result of being covered by Medi-Cal, the state of California experiences a gain of $1.7 billion in personal income per year as a result of the program. Critically, these estimates do not rely on a specific amount of funding for the program nor do they require a specific structure to the financing of the program. Hence, a reform proposal should aim to deliver the same quality access to care for this population at a more affordable and sustainable price point through the most appropriate coverage mechanism. Neither the funding for the coverage expansions within the Affordable Care Act nor the additional spending induced within the healthcare industry has occurred in a vacuum. Rather, each has a ripple effect within the larger state and regional economy. These effects are commonly referred to as “multipliers.” The additional funds that flow to doctors and hospitals allow them to buy more medical equipment; the makers of medical equipment pay salaries to their employees; these employees purchase goods from businesses in their hometowns; and so the initial injection of funds circulates throughout the economy. The economic effects of financing reform have similar reverberations. 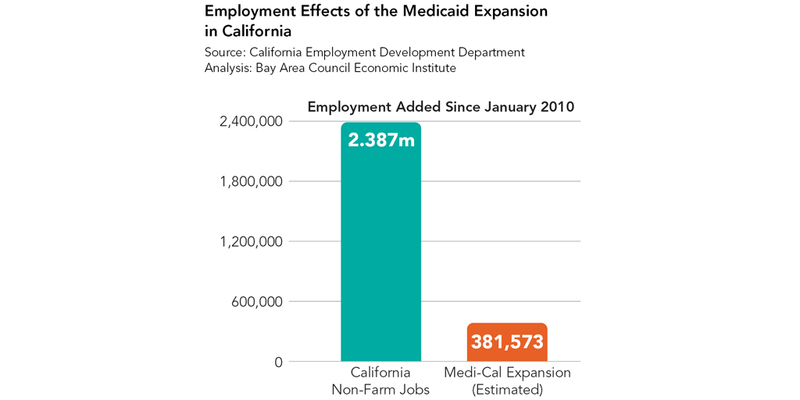 A Bay Area Council Economic Institute study from 2012 estimated that the total economic impact of health reform in California was an increase of over 100,000 jobs.12 This was based on a substantially lower expected enrollment, however. 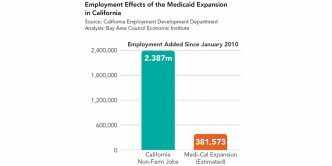 In reality, California has added over 5 million new individuals to Medi-Cal since the passage of the Affordable Care Act, adding about $21.8 billion into the economy through the healthcare sector. Estimating the effect on ­employment through that level of additional spending in the healthcare sector yields 381,573 new jobs. (California has added 2.387 million non-farm jobs since January 2010, so this is but a small piece of total job growth). However, it is not possible to increase healthcare ­spending without any downside risk. This spending crowds out other investments in the economy and puts a financial strain on companies, especially small businesses, to provide for the cost of healthcare for their employees. The Affordable Care Act also hiked taxes on high-income taxpayers and added tax burdens on many parts of the healthcare economy, including health insurers and medical device manufacturers. Some groups have argued13 that these added burdens created a drag on economic growth and job creation. 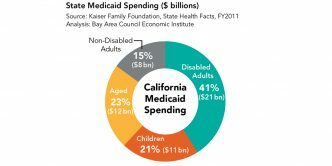 The Affordable Care Act also added to federal and state health spending, particularly through its Medicaid expansion, placing significant financial pressure on the federal and state budgets across America—including in California. There is a debate regarding whether different funding levels that are proposed for public programs or different amounts of tax credits to purchase private insurance are adequate. However, no amount of healthcare financing is going to be adequate if healthcare costs continue to rise to the extent that they have. And there is no reason to spend any money for which we are not getting good value. It is now a widely understood fact that the United States spends dramatically more per capita on healthcare than other countries without getting better health outcomes or even a greater volume of services. Part of our lower value for spending in the United States is the factor that approximately one third of healthcare spending—certainly more than $500 billion of the approximately $2 trillion that the country spends on healthcare each year—is going toward unnecessary, duplicative, or harmful care, according to the estimates of leading economists.14 The goal of healthcare reform proposals, therefore, is ultimately to reform the delivery of healthcare to make it more affordable, more accessible, and of higher quality. We must not simply take the current delivery and cost of healthcare as a given and focus only on how to pay for it. This is why providing more flexibility to states in the administration of their Medicaid programs is often a key feature of current reform proposals. However, those proposals are sometimes less than specific on what “flexibility” means in practical terms. Here, we propose a number of concrete areas in which it is possible to bring down healthcare costs while preserving or improving the quality of care people receive. We differentiate this from other state-based reform efforts that could benefit from greater federal flexibility, such as allowing Medicaid programs to require a co-payment for care or to impose work requirements as a condition for ­remaining enrolled. Whatever implications such proposals may have, they do not directly address the affordability of high quality access. It is also important to understand that states already receive “1115 waivers”15 from the federal government that allow them to ­customize elements of their state Medicaid programs, and the Trump administration has telegraphed a ­willingness to provide even more flexibility on state requests for waivers going forward regardless of the outcome of current reform proposals. The following sections outline seven areas that we believe have the highest likelihood of reducing both government spending and overall spending in an era of increased flexibility. These are strategies that do not simply shift these costs onto other payers or onto program recipients. Policymakers should consider adoption of reforms like these, whether the federal government restructures Medicaid as a per capita acuity-adjusted payment per enrollee or preserves the existing entitlement. And while the specific reforms adopted may differ, our goal here is to articulate some broad areas of possible reform. Healthcare competition occurs primarily on the level of regional healthcare markets, often anchored by metropolitan areas. 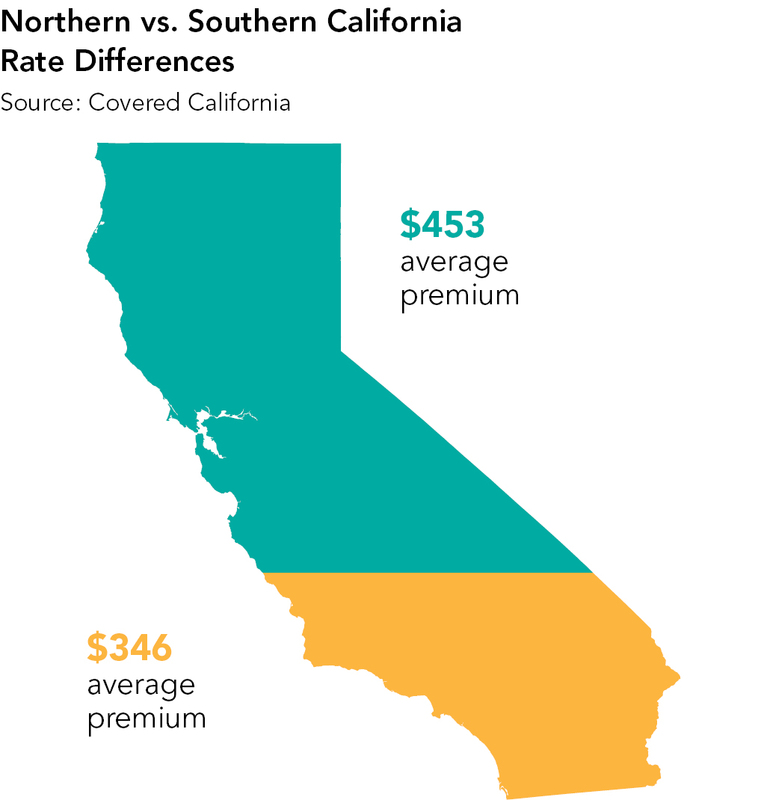 A major factor affecting the cost of healthcare is the amount of competition among hospitals and doc-tors in a given region.17 California provides a striking example of this. The entire state has the same regulations as it relates to health insurance products—a factor often cited in the differences in the cost of health coverage—but the average premium in northern California is 30% higher than in southern California and this is almost entirely a function of provider competition.18 The Los Angeles metropolitan area has over 80 hospitals, most of which be-long to different systems, while Northern California is dominated by a few large systems. There are many ways to address provider competition, including anti-trust enforcement. Sometimes provider competition can be achieved through insurance competition. 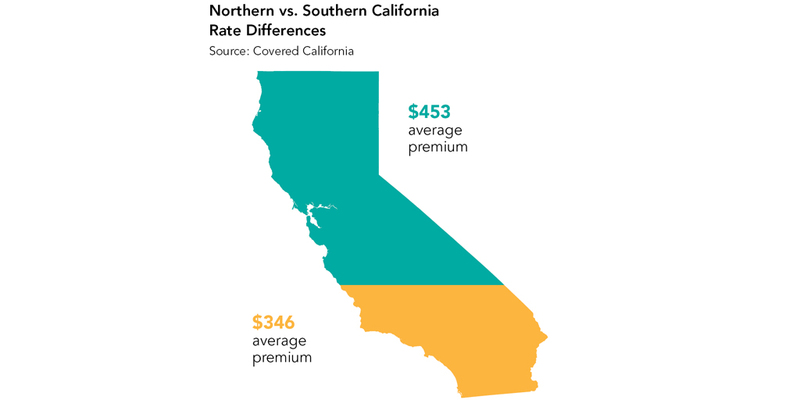 Covered California, the state’s Affordable Care Act marketplace, took an active stance toward creating competitive markets by encouraging the entry into this market of plans that had traditionally served Medicaid populations. These plans provided access to different networks of providers. At the same time, plans that have traditionally been involved in the commercial market in California have moved into the Medicaid market along with their provider networks. “Managed competition” among these networks—a structure originally proposed by Stanford professor Alain Enthoven—can be one of the best ways to improve value for spending. The more competition there is in a market among providers, the more market forces can be unleashed to improve quality while controlling costs. This has an impact on all payers in the healthcare system—public programs as much as the privately insured. California has a long history of providing broad financial incentives to encourage high-value care under the man-aged care framework. The Medi-Cal Managed Care program began in 1973 and now covers the vast majority of Medi-Cal enrollees in all 58 California counties. These enrollees receive care through one of the managed care delivery system models across the state, for which Medi-Cal pays a per-enrollee-per-month reimbursement, in-stead of through traditional fee-for-service Medi-Cal, in which providers are reimbursed for each service provided. The theory is that more centrally organizing the care of enrollees and paying providers for value rather than the volume of services will lead to better outcomes at lower cost. California has been making significant expansions of managed care in recent years. These have been focused on enrolling children and families, seniors, individuals with disabilities, low-income pregnant women, and those dually eligible for Medicare and Medi-Cal. These populations are more vulnerable than average Medi-Cal enrollees, and transitioning them to managed care is intended to improve outcomes for these high-cost populations. One factor driving up the cost of healthcare in the United States is an undersupply of primary care providers. A variety of factors, many a result of government regulation, have contributed to the shortage of highly trained health clinicians. Primary care physicians work long hours, receive relatively lower reimbursement, and must navigate a maze of paperwork and regulation on a daily basis. General practitioners are a cornerstone of the healthcare system and finding solutions to these problems is critical, but so too is utilizing all health personnel to the full extent of their education and training. One way to do so is to more broadly utilize nurse practitioners—a profession developed specifically in response to physician shortages of the 1960s. States still imposing practice restrictions on nurse practitioners and other mid-level practitioners should consider amending or removing these barriers altogether. This would allow these highly-trained healthcare professionals to practice to the full extent of their training and education. Incremental steps may be necessary to move states along the continuum toward full practice, but an ultimate goal is full practice within guidelines of ­training and certification. Removing restrictive practice regulations at the state level is an important and significant first step. However, various federal regulations also hinder nurse practitioners from practicing to the full extent of their abilities and stifle innovation. Examples include barriers for nurse practitioners to serve as primary care clinicians in state Medicaid programs due to provisions in the Balanced Budget Act of 1997, and the exclusion of nurse practitioners as primary care clinicians under the Medicare Shared Savings Program. A Bay Area Council Economic Institute study from 2014 estimated that one policy change in this area, the granting of full practice authority to nurse practitioners, would save $1.8 billion in costs for primary care visits alone within the first 10 years of implementation. States still imposing practice restrictions on nurse practitioners and other mid-level practitioners should consider amending or removing these barriers altogether. This would allow these highly-trained healthcare professionals to practice to the full extent of their training and education. Medicaid provides health- and long-term care coverage to children, young adults, and older people with low in-comes and few assets, or those impoverished by the high costs of health care. Especially through its funding for long-term care services—such as nursing home, home care, and hospice—Medicaid is a major source of financing for end-of-life care, the period of time when individuals are terminally ill, particularly for beneficiaries who are not Medicare eligible. The National Palliative Care and Hospice Association defines palliative care as: “patient and family-centered care that optimizes quality of life by anticipating, preventing, and treating suffering. Palliative care throughout the continuum of illness involves addressing physical, intellectual, emotional, social, and spiritual needs and to facilitate patient autonomy, access to information, and choice.”19 Improving access to palliative care for people with serious illness or nearing the end of their lives has the benefit of improving care quality and reducing suffering as well as lowering healthcare costs. Some solid evidence has emerged on demonstrated best practices in this area. Fortunately, this evidence suggests that end-of-life planning can extend people’s lives as well as preserve the financial resources of their families and bring down total healthcare costs for the system.20 Unfortunately, this issue is generally difficult to discuss and is ripe for misrepresentation. It has been shown that good palliative care, including the use of pain management and hospice, can produce savings for all payers. In this, as in all other areas, proper planning is paramount. All payers, when feasible, should encourage use of POLST (Physician Orders for Life-Sustaining Treatments), a very detailed type of living will that ensures that the individual’s wishes are respected with regard to their treatment. California has made a number of advancements in recent years in promoting palliative care, including the passage of a law (SB 1004) that created a palliative care benefit under Medi-Cal managed care for adults. All payers, when feasible, should encourage use of POLST (Physician Orders for Life-Sustaining Treatments), a very detailed type of living will that ensures that the individual’s wishes are respected with regard to their treatment. 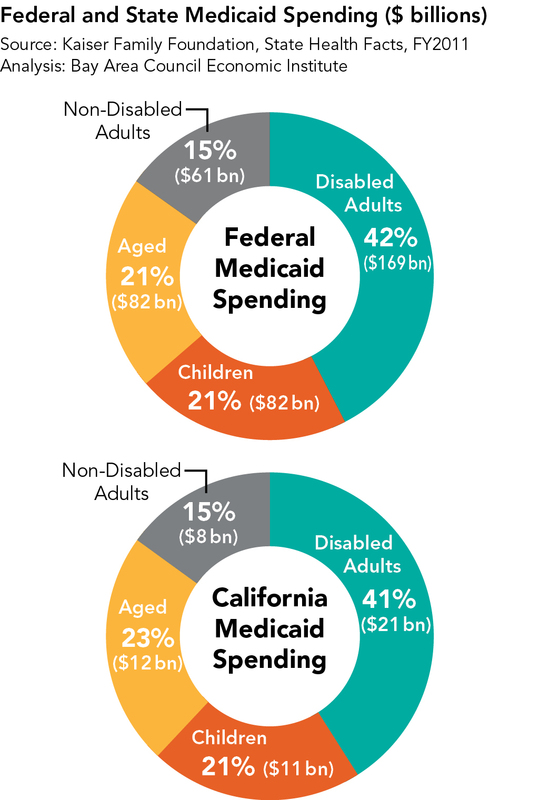 According to data from the Department of Health Care Services (DHCS), Medi-Cal beneficiaries in the aged and disabled eligibility groups make up less than 20% of the total Medi-Cal enrollees but account for 70% of Medi-Cal expenditures. A key driver of these Medi-Cal expenditures is Medi-Cal’s role in financing long-term care for these beneficiaries. Two-thirds of nursing facility residents rely on Medi-Cal to pay for their care. In addition, there are approximately 1.1 million low-income seniors and people with disabilities who are eligible for Medicare and Medi-Cal (known as “dual eligibles”) in California, many of whom are in need of long-term care. Dual eligibles are a high-cost population who experience poorly coordinated care due in part to cost-shifting and misalignment between the two programs. Given the amount of resources for the Medicaid program that are directed towards long-term care, it is important to incorporate best practices from models that have been shown to reduce healthcare costs for aging populations through promoting aging at home. Among these innovations is the Program of All-inclusive Care for the Elderly (PACE), a proven model for successfully delivering medical and long-term care for individuals eligible for nursing home care whose desire is to age at home. The high percentage of California PACE enrollees who are dual eligible benefit from PACE’s integrated care. As part of the Coordinated Care Initiative, the Cal MediConnect pro-gram was launched in 2014 and covers Medicare and Medi-Cal services under a single health plan. Cal MediCon-nect aligns financial incentives between Medicare and Medi-Cal with the goal of better coordinated care for enrollees. Although enrollment and development has been slower than anticipated, Cal MediConnect shows promise. California’s previous 1115 waiver, known as “A Bridge to Reform,” had the goal of improving health outcomes, slowing spending growth, and preparing for an unprecedented expansion of the program. California’s current waiver, approved in December 2015 and called “Medi-Cal 2020” builds on these goals. Medi-Cal 2020 contains a project aimed at improving care for those with complex health requirements. Individuals with various co-morbidities are responsible for a large share of overall healthcare spending, and mental illness, substance abuse issues, and ­homelessness often complicate addressing their needs. Under the whole-person care pilots, a county, hospital authority, or regional consortium can coordinate various agencies to manage this care better and more efficiently. 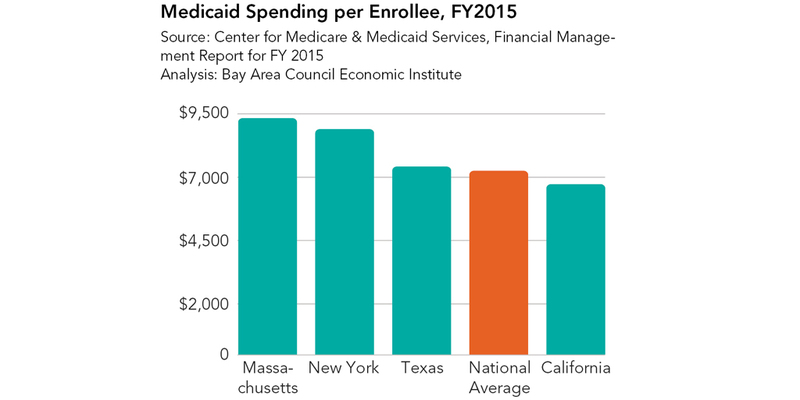 States receiving per capita allocations for Medicaid enrollees would be able to implement the lessons of these pilots through reducing administrative barriers to providing team-based care. However, such barriers can be reduced regardless of the structure of the program going forward. The scope of practice regulations mentioned above are among the regulations that need to be adjusted to implement best practices in team-based whole-person care, as is moving to a more flexible structure of reimbursement through the effective use of managed care contracting. One large, and sometimes unexpected, cost for Medicaid programs is pharmaceuticals. Addressing the high and rising costs of pharmaceuticals and biologicals is necessary in any comprehensive strategy to get better value for medical spending, and therefore these drugs should be subject to value assessments from the state. It is essential that the scope and methodology of these assessments be sound, such that they do not dampen innovation or reduce access to lifesaving drugs. And the necessary regulatory flexibility must be in place to operationalize these policies so that they do not run afoul of federal anti-kickback laws or best price calculations. However, it is not entirely clear that value-based payments within the context of a set yearly amount of spending is always going to be the wisest approach to spending in this area. The class of drugs that cured Hepatitis C was responsible for supplemental budgetary allocations in California in 2015 and 2016 of $300 million in total. Within a policy context where states receive a single lump-sum payment for their state program or a per capita payment per individual, or for which there is currently no prior demand or line item in the budget, these extraordinarily high costs could create substantial financial liability for the state. However, in this particular instance, this was a drug that actually cured a condition and therefore alleviated a great deal of downstream healthcare costs as well as greatly improving the quality of life of those who received it. Therefore, there are instances in which carving out payments for particular drugs, such as those within the Medicare program, may be appropriate. Federal flexibility for the states, which encourages such reforms, will help to meet the three goals of improving the quality of care for program enrollees; making the trajectory of health spending more sustainable for states and the federal government; and rewarding high-value care. Within the current political environment, there is bound to be disagreement on the level and structure of Medicaid funding. Reforms that can attract bipartisan cooperation should focus on the affordable delivery of quality healthcare access to low-income Californians and others who qualify for the Medi-Cal program. These re-forms and practices can help bring healthcare costs down for all, rather than simply shifting them among payers or governments or onto the low-income individuals that rely on these programs. Ultimately, this will help ensure the fiscal sustainability of Medicaid and preserve access to care for those who need it. Micah Weinberg and Patrick Kallerman, Mainstreaming Medi-Cal, Bay Area Council Economic Institute, June 2016. Medi-Cal’s Historic Period of Growth, Research and Analytic Studies Division, California Department of Health Care Services, August 2015. Congressional Budget Office, Historical Tables, January 2016. 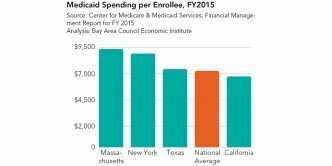 James Capretta, A Safety Net That Works: Medicaid, American Enterprise Institute, February 2017. David Dranove, Craig Garthwaite and Christopher Ody, “Uncompensated Care Decreased At Hospitals In Medicaid Expansion States But Not At Hospitals In Nonexpansion States,” Health Affairs, August 2016. Kaiser Family Foundation Analysis, 2016. Jack Hadley, Sicker and Poorer: The Consequences of Being Uninsured, Medical Care Research and Review, June 2003. Institute of Medicine, Hidden Costs, Value Lost: Uninsurance in America, National Academies Press, 2003. Jon Haveman and Micah Weinberg, The Economic Impact of the Affordable Care Act on California, Bay Area Council Economic Institute, May 2012. Curtis Dubay, Obamacare and New Taxes: Destroying Jobs and the Economy, Heritage Foundation, January 2011. Institute of Medicine, Best Care at Lower Cost: The Path to Continuously Learning Health Care in America, National Academies, 2013. Bob Kocher, “How I Was Wrong About ObamaCare,” Wall Street Journal, July 31, 2016. Micah Weinberg and Patrick Kallerman, A Study of Affordable Care Act Competitiveness in California, Brookings Institution, February 2017. Micah Weinberg and Patrick Kallerman, Scope of Practice: Full Practice Authority for Nurse Practitioners Increases Access and Controls Cost, Bay Area Council Economic Institute, May 2014. Corinna Klingler, Jürgen in der Schmitten, Georg Marckmann, “Does facilitated Advance Care Planning reduce the costs of care near the end of life? Systematic review and ethical considerations,” Palliative Care, August 2015.